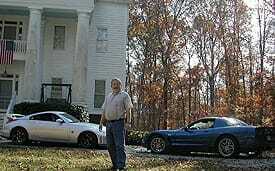 As a Corvette aficionado, I have owned 6 Corvettes, but currently only have two. (This will hopefully change, when the Club builds some garage space!) One is a 1985 model (which actually was my first Vette) modified for the SCCA Street Prepared class, which I successfully tracked in the SCCA Solo I program in the 1990’s. The other one is a 2002 Corvette Z06 with a few bolt on mods which I have been driving at Road Atlanta (very close to home in Jefferson, Georgia) at Driver Events held by various organizations. The latest addition to my track cars is my daily driver which is a 2008 Nissan 350Z NISMO (track edition). A new 2008 Chevy Silverado hauls them to the track. After competing in the Solo I program for years, and finishing in first place in the South East US three years running, I went looking for more track time. I found this in Driver Events, which provide much more seat time (than high speed time trials in Solo I), but they largely lack the element of competition. I actually found this somewhat refreshing, as I previously became so focused on competing, that I was not having as much fun. The Driver Events are a lot more fun and I can exercise my toys in the manner they were intended to be driven and do so in a relatively safe and controlled environment. An engineer by education, I am the Director of Technical Services for ViaSat Inc Antenna Systems. ViaSat is a US public company involved with satellite communications, high bandwidth and advanced encryption technologies. I manage the customer service group for this division, which provides fast response technical support around the globe for operators of our satellite ground stations, which include various commercial, government and military communication applications. My membership will largely be directed at my own pleasure, but I look forward to the possibilities of leveraging this for business purposes. As a “track junkie”, my work schedule just does not provide for a satisfying level of track access, working through other organizations. I have thought for years that Georgia could support an operation such as this. I am excited to be part of this from the beginning as a Founding Diamond member and am extremely motivated to help the endeavor to be successful. I really like the initial Club ideas and the potential future expansion plans. Based on their research, I believe that the Club has selected the right mix of facilities and planned capabilities to make this a success. It will be an exciting place to drive, as well as to socialize with other folks with similar interests. I will be there on day one. What was that date?